QMdiSubWindow::RubberBandResize 0x4 If you enable this option, a rubber band control is used to represent the subwindow's outline, and the user resizes this instead of the subwindow itself. As a result, the subwindow maintains its original position and size until the resize operation has been completed, at which time it will receive a single QResizeEvent. По умолчанию эта опция запрещена. QMdiSubWindow::RubberBandMove 0x8 If you enable this option, a rubber band control is used to represent the subwindow's outline, and the user moves this instead of the subwindow itself. As a result, the subwindow remains in its original position until the move operation has completed, at which time a QMoveEvent is sent to the window. По умолчанию эта опция запрещена. 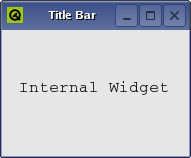 This property holds sets how far a widget should move or resize when using the keyboard page keys. This property holds sets how far a widget should move or resize when using the keyboard arrow keys.